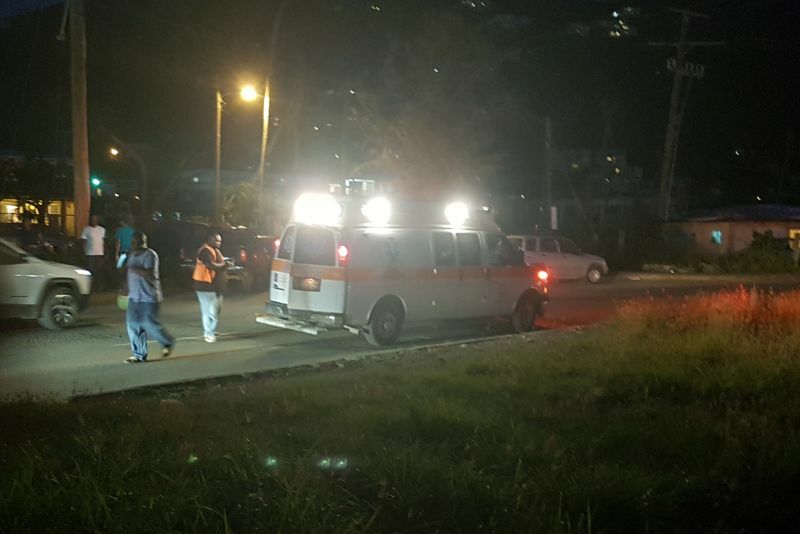 PASEA ESTATE, Tortola, VI- A scooter rider was taken to Peebles Hospital by ambulance after he became involved in an accident with a motor vehicle near Delta Gas Station at Pasea Estate, Tortola, moments ago, January 22, 2018. According to reports reaching this news site, an SUV was proceeding into the turnoff just past the gas station heading East, to get to the West bound lane of the James Walter Francis Dual Carriageway, when the motor scooter slammed into it. 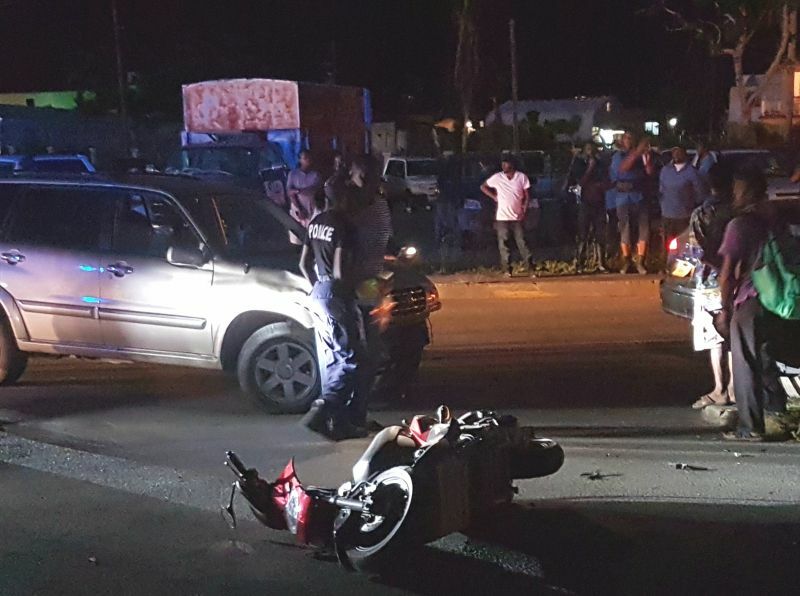 The motor scooter was reportedly heading East. The extent of the motor scooter rider's injury is unknown. Police are also on the scene. The flow of traffic has been affected as a result. At one point traffic was backed up from Delta Gas Station to the traffic lights at Station Road. The Govt should ban all motor cycles. If they don't ban them, then anybody caught riding one without a helmet or with a loud radio playing should have their scooter trashed. Why would Government do this? Then we should ban all cars since people drive them without a seatbelt and they also play loud music? Just impose a hefty fine on the lawbreakers and this will circumvent the misuse of Scooters. We have to understand that each action has an equal and opposite reaction. Ask yourself this, those people that can't afford a car, what will they do now to acquire a mean of transportation? ROB poor people!!! IT WILL NOT STOP AS LONG AS POLICE LET THEM GET WILDER & Wilder. Each has to outdo the other. Had one going between cars illegally and when two cars were too close he stopped, repeatedly blew his horn and yelled obscentities No helmet, no place, no lights. A while ago had one hit my mirror. They NEED TO BE CONTROLED!!! But the car is in the wrong tho so I guess they should crush the car then. Cause the last time I checked going from the exit of right way, going toward the intersection by delta is an illegal turn. I hope he was wearing a helmet. Getting gas today at Delta saw two baby bikers going east at about 60 mph with no helmets and crossing lanes . Dont come near my truck like that . I promise you ...road pizza . The police are gutless to stop it . Pathetic . I feel sorry for the unsuspecting car driver. These scooters have frayed everyone's nerves. Why don't the cops get off their behinds and stop the illegal scooters. I see a few that obey the laws and wear helmets. Even so, I hope the scooter driver is OK. When is the potential for carnage, flouting the law, reckless riding and the nonsense going to stop? When is the exposure to risk, legal liabilities, unnecesssry injuries to riders, drivers and pedestrians go to stop? When is the unnecessary demand on medical professional going to stop? When is the police going to start doing its job? Are parents complicit on the nuisance? Sorry as I was saying some parents and family members let their kids out to cause chaos then blame the cops when things go wrong. As long as criminals are celebrated as heroes in this place things will get worst. The young man was not speeding, the woman was wrong to come from riteway and go straight across to the Delta Turn off. She was supposed to go up the road and come round the roundabout. Could you imagine Robo Cop in his personal vehicle came there in his civilian clothes, parked in the spot designated for the Ambulance looking news. One of the two Red Cross Volunteers who were at the scene assisting with the young checking his vitals asked him to remove his vehicle from the designated space he did not even move. I think this was sheer ignorance and begs to question his policing ethics. @Joan, I think he parked there to secure the scene. In my opinion he was right with what he did. There was no need for the hostility. There was lots of space for the ambulance. It have more uninsured and unlicensed motor cars and trucks on the bvi public roads than motor scooters.90% of all the trucks are not insured and the government still giving those same trucks work.they should have insurance before giving them work.talk that.